I would like to have proven to me the above formula, mostly because I don't quite understand it. The formula is an approximation of the profit from gamma trading/gamma hedging, $$0.5 \Gamma (\Delta S)^2$$ So, my questions are, how to prove that, and secondly, what does it mean exactly by "profit"? Today, an ATM 1-year 25 % volatility call is bought for 10, and we short $\Delta = 0.5$ in the underlying, which is worth 100. So working that out, we get portfolio value $\Pi = 10 - 50 = -40$, our portfolio value. Some time later, the spot goes up to 105. The call goes up in value, from 10 to 13. Currently we have shorted $0.5$ of the underlying, so we owe $0.5 \cdot 105 = 52.5$, so we have $\Pi = -39.5$. 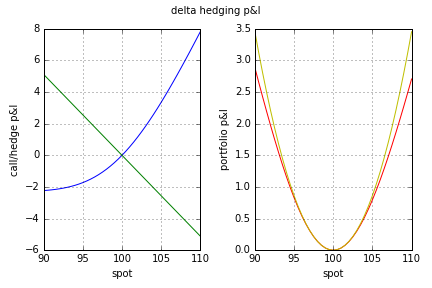 Then we perform our re-hedge: if delta moved from 0.5 to 0.6, then we need to short 0.1 of the underlying. So, we add $-10.5$ to $\Pi$, i.e, $\Pi = -50$. Where does the formula from above come into the picture here? Assume you buy a plain vanilla call option at the price $V$ and the spot $S$. You immediately delta hedge buy selling $\partial V / \partial S$ units of the underlying asset. This is visualized in the below plots. They are based on $T = 1 / 12$, $K = 100$, $S = 100$, $r = 0\%$, $\sigma = 20\%$. The blue (green) line is the p&l of holding a long (short) position in the call option (underlying asset). The red line is the actual net portfolio p&l and the yellow one is the second order approximation of the latter using the gamma. Not the answer you're looking for? Browse other questions tagged delta-hedging gamma delta-neutral or ask your own question.